The Siberia V3 remains mostly true to what made the V2 great: durability and flat, true sound. A quiet mic and a lack of adjustability hold it back from greatness. SteelSeries has been making the Siberia gaming headset in its various forms for years now, and each iteration has offered a good all-round package at the hundred dollar mark, though it must be said without really excelling in any particular area. The Siberia is about covering the bases: its aesthetic has always been appealing, the build quality has always been deceptively good for such light headphones, and the sound production has long been reliable and clear. There have been issues along the way, though—we’ve never found the old model Siberia an especially comfortable headset compared to its peers in the price range (the floating headband design works for some heads and not others), and the mic hasn’t previously been its strong suit either. With its latest range of ‘phones, the Danish manufacturer looks to silence all criticism with a new and improved Sibera V3 model, and an all-new model, the Raw Prism, way down in the $60 range. The Siberia V3 is relatively familiar territory. Actually, if you’re familiar with the V2 model, it’s Attack Of The Clones territory. The closed cups are joined by a floating headband and two lightweight structural bands, the idea being that the headset rests on your head without exerting too much pressure, and without the need for adjustment. This works in the field to an extent. Mindful of my previous discomfort with this design, I gave the V3 to a few friends and coworkers to try on—people with normal-sized heads, essentially. They reported back with largely glowing reports regarding comfort, so I’m prepared to admit that hey, maybe my head’s just a bit small. It might seem a trivial point, but the absence of adjustability in the V3’s headband means it’ll either fit you or it won’t; there’s no in between. It’s better news for building materials and design elsewhere. Memory foam contact pads line each earcup, finished in leatherette, sealing off external noise reasonably well and dodging that irritating seashell effect you experience when sound’s allowed to leak in somewhere around your ear. Possibly due to that aforementioned smaller cranium of mine, I didn’t find that the earcups cancelled external noise completely though, which means they do also leak a bit. Pro tip: be sure to turn down the volume a notch or two when listening to the So You Hate Your Sh*tty Job podcast at work. The absence of adjustability in the V3’s headband means it’ll either fit you or it won’t; there’s no in between. Long sessions aren’t a problem while wearing the Siberia V3 headset, largely thanks to its extremely lightweight design. It's easy to perceive this as flimsiness or cheap building materials, but the Siberia models past and present are surprisingly bomb-proof. There’s no creaking, rattling or other such unsettling noise when you put on or take off the headset, and though I don’t dare go through with it I think it could probably withstand being sat on accidentally. It’s obvious that SteelSeries opted for plastic rather than something sexier like brushed aluminium to keep the overall weight down. The V3’s long-term comfort is the result of that decision, so it’s hard to berate it on the grounds of its look. Even though that look is a bit plastic-heavy for a $100 headset. Alright, that’s the last I’ll say about it. After all, the absence of any tribal designs and neon lights is a virtue indeed, and it should be noted that the V3’s available in both black and white. 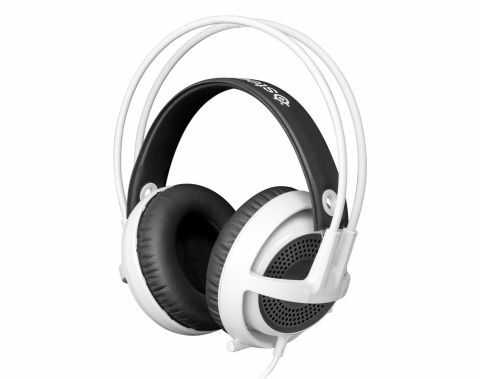 Overall it’s a net gain for SteelSeries’ revamped headset in terms of looks. That leads us onto sound quality. The Siberia has never been about making wild claims regarding surround sound or extreme bass, instead delivering a flatter, truer audio than most gaming headsets. That’s one of the reasons the V2 became so wildly popular, and it’s the piece of the puzzle that has changed the least in this redesigned V3 model. It’s clear and sibilant out of the box, before you begin to tweak EQ settings or experiment with profiles in the SteelSeries Engine software, so when you go to listen to your favourite song – number one on the to-do list when testing out some new cans—you’ll hear the nuances you know to listen out for. What you won’t hear so much of is low-end thump. The V2 model was kitted out with big old 50mm drivers capable of rendering quite the bass rumble. The V3 has the same drivers, according to Steelseries, but their placement has been adjusted, and they end up sounding less powerful in the low-end to my ear. There are only a handful of situations where you’ll really feel the bass lacking. 1) When playing single player campaigns made by the likes of DICE and Treyarch, and 2) watching the kind of movie the likes of DICE and Treyarch use as inspiration for their games. Explosions aren’t best-in-class from the Siberia V3, but its sound is amply clear enough for multiplayer shooters and stealth games that really require a good, clean audio signal. There is the software suite to experiment with, offering a few different EQ presets for varied situations. But as anyone who tried to make their headset more bassy by dragging sliders around on an EQ panel will tell you, you can’t summon good bass from software if it wasn’t there to start with. By boosting signals in the low-end, the overall sound becomes either muddy or distorted. You’ll just have to live with the Siberia V3’s perfectly agreeable, flat-sounding tone. The Siberia V3 does have a clear weakness in its microphone. SteelSeries goes with a retractable mic design that sits slightly in the leftfield compared to its competitors. The advantage is in the neatness of its design—just push it back into its hole when you’re not using it, or tap the side of your left earcup to mute it. The inevitable disadvantage is that by default it’s extremely quiet, so you’ll need to use that SteelSeries Engine software or your OS settings to boost the mic gain if you want people to hear how totally serious you are when you tell freshspawns to hold it right there and take off their shirts in DayZ. However, boosting the signal means you’re also amplifying all the background sounds around you, and the dirty part of the audio signal coming from the electret mic, which the hard-wired noise gate can’t always filter out. In short: you’ll be heard just fine after some tinkering, you just won’t be broadcasting in crystalline tones. No headset is perfect, of course, so it’s important to weigh up what each drawback means to you. In this case, very few people will find the less-than-stellar mic anything more than a minor annoyance. If you’re not looking for surround sound and can hack a 1.2m wired setup, the Siberia V3 follows in the proud tradition of its ancestors and offers one of the best all-rounder packages out there. It’s lightweight, sounds great out of the box and the custom profiling software on offer is genuinely useful. If you have an opportunity to try on the headset before you buy it, it’s certainly worth doing so. There’s nothing you can do to make it fit better once you put it on, so size should be a real consideration if you tend to find headsets too big for you. A word to the wise for UK readers, too: that $100 pricetag translates to, um, £100. With that in mind the V3 represents considerably less value for money the other side of the Atlantic.